Laurie here sharing an Easter card today featuring Tutti Designs Floral Easter Egg. I love all the beautiful Easter dies in this last release....you can check them out here. I cut the floral egg out in a piece of alcohol ink paper in pretty blues,purples and pinks. Then I adhered it onto a white scalloped stitched nesting rectangle. 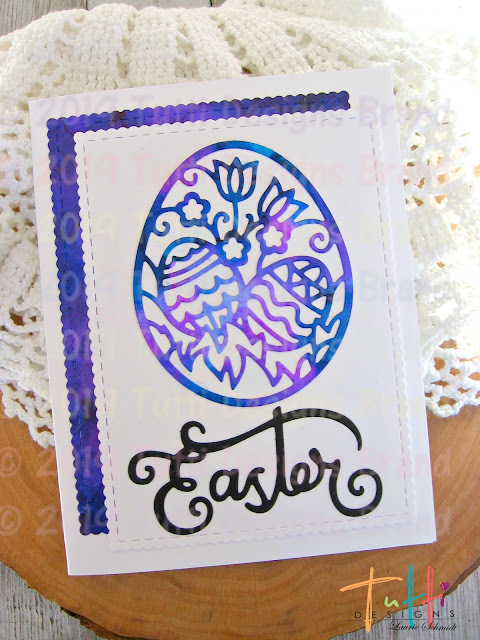 I also added the sentiment,"Easter" for Tutti's Happy Easter Bunny die set. I cut out another scalloped stitched nesting rectangle from the same alcohol ink paper and tucked in beneath the white one for some added color.